I went hunting for the first time in my life and bagged a squirrel with a good clean shot! I really enjoy hunting and hope to continue to learn and grow in harmony with my food chain and ecosystem. Yesterday, I went hunting for the very first time! It was exhilerating and beautiful : ) and definitely aligned with the principals of permaculture. At around 8:00 in the morning, Jon taught me all about gun safety and we did some target shooting with a variety of firearms. In the end, my weapon of choice was a 22 caliber rifle, mainly because it was lighter that the 12 gauge and didn’t have much kick-back. I found out later that it is actually a common choice for beginners. After about an hour of gun safety and target practice, we stalked out cautiously into the woods, walking heel to toe in order to stay quiet. Jon showed me how to find squirrel nests, how to observe for movement out of the corner of my eye. We found a patch of ferns overlooking a grove of beech nut trees where we’d spotted two squirrel nests. The best part of hunting was actually sitting calmly in the cold morning air, listening and watching intently. It felt like a meditation, or mindfulness. After about an hour of sitting in the cold, he told me to sit out there as long as I liked. At this point, we hadn’t seen anything, and my toes were getting cold. But I didn’t want to give up quite yet. 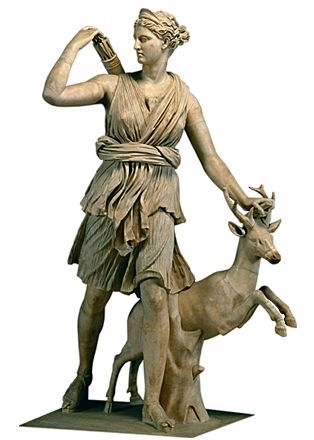 Artemis, Goddess of the Hunt. About 20 minutes later, right when I was about to quit, I caught movement out of the corner of my eye. It was a squirrel! This was the first time I appreciated the power of the squirrel’s camouflage. Their fur really is the same color as tree trunks in winter sunshine, and I kept on losing the squirrel in my sight. When I felt I had a good clean shot, I pulled the trigger. *Click* I’d left the safety on, and at this point the squirrel had wound back around the tree. I knew that I just needed to be patient, and it would have to come around again. I don’t know how long it was before the squirrel came halfway around the tree and perched itself on a whorl. When I had it in my sights, I pulled the trigger and missed. But the squirrel just froze, as if it was waiting to give me a second chance. Like he was giving his life to me. I took a second shot, and the squirrel pitched over and fell. I couldn’t believe it. I had never been good at any kind of sport, ever. I can’t even throw a softball. I ran out in disbelief to find the squirrel, still warm, calmly lying among some branches. I said a prayer instinctively, grateful to the squirrel and the universe for offering me this squirrel’s life. When I walked back up to the house, Jon Arthur was talking with Seneca. “Did you get anything?” He asked rhetorically. “I did.” I said, my voice reflecting my own shock. 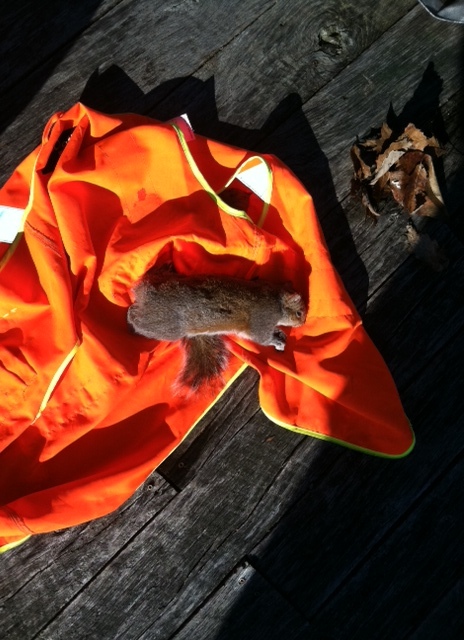 I unwrapped the shroud I had made for the squirrel out of the bright orange safety vest I had been wearing. We took the squirrel out to the barn, and put it on a piece of cardboard to catch the blood and entrails. We would later burn it. Jon showed me how to make an incision across the squirrel and then peel the skin off with our fingers. I’m not as used to ripping flesh apart with my bare hands as Jon was, so I resorted to using an exacto knife at times. Jon showed me that I had actually made a very clean shot- right through the heart and lungs. He reassured me that the squirrel had died nearly instantly and painlessly. After we cleaned the squirrel, we went back out to the tree where I had shot it and buried the head, tail and other fur. We said a prayer. Jon is Lakota, and showed me how to sprinkle tobacco to the four directions in gratitude to the squirrel people for giving their life so we could eat. After cleaning the squirrel, I said a prayer and mindfully created a squirrel stew on my woodburning stove to share with my friends. After Jon left, I decided to light the sauna to cleanse after my kill. 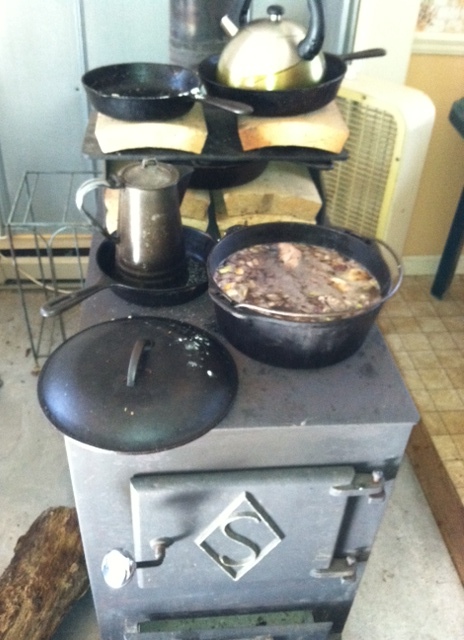 While the sauna was warming up, I prepared the squirrel as a stew in a cast-iron dutch oven on my woodburning stove. I added water, malbec, bay leaf, celery, carrot, parsnip. onion, potato and cabbage. I made a rue of goat butter, tapioca starch, fresh garlic and thyme. Strangely enough, I think my kill made me a more compassionate and aware person. There is a cat near my house named Tadpole that is very sick. Every other day, Starflower comes to feed him and take care of him, along with all of the other stray cats in our sanctuary. He had gone missing during the ice storm and I was excited to see him! He looked especially hard up that morning, and I brought him some warm cat food from inside the house, and set it up for him near some couch cushions in the sun. I didn’t want him to suffer. I sent a photo of him to Starflower that he was still okay, even after the storm. After I had prepared the stew, I walked out to the sauna to see an old woman in a Babushka standing beside it. There were two other people trying to get their car out of the mud from the tree of heaven. “Christina?” The old woman asked. I nodded, wondering who she was. It turns out that she was Tadpole’s original owner. That when Starflower told her that he had disappeared in the storm, she had waited until the roads were safe to get her friends to drive her out here. She thought he was gone, and was so delighted to see that he was still here, and taken care of, and had a warm house to sleep in in the barn. “I’m Ukrainian” She surprised me. “Ne- odna- mova-pamyatayu” she spoke in a broken tongue. I didn’t know what to say. I wanted to sing. The conversation that ensued is for only me to remember. What it assures me is that this is a benevolent, interconnected universe, and that everything happens for a reason. That death, and compassion, and resurrection happened today. I know I am in the right place, and that I will continue to do great things during my time here at Crow Forest. Funny, I feel the same way about the for food animals on our farm!